Whether you’re redecorating your bedroom or are looking to upgrade to a bigger bed, choosing the right bed frame is an important decision. Do you want something simple that will blend into the rest of your decor or a gorgeous piece that will make a statement? One of the most innovative brands out there is Zinus. They offer a wide variety of options for different tastes and situations at a variety of price points. That’s why we want to make sure you pick the best Zinus bed frame for you. To figure out which designs are the best of the best, we looked at a few factors. First, weight capacity. This is really important because it makes sure the frame maintains its integrity and lasts as long as possible. Next, we considered construction materials in terms of both durability and style. We know that some people prefer low-profile designs while other like a little more ground clearance so we factored in height as well. Finally, we made sure they were all covered by a reasonable warranty. 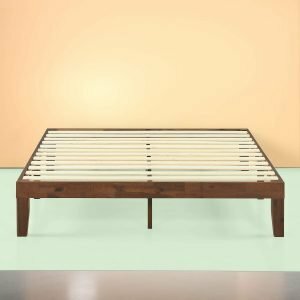 We put in a lot of time researching Zinus itself as well as looking at the reviews of experts and people who sleep on these bed frames every night. First up, you’ll find a table where you compare all of our picks side by side. 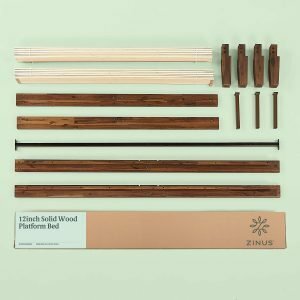 Next up are detailed reviews of each product followed by an in-depth buying guide that can help you find the best Zinus bedframe for you. 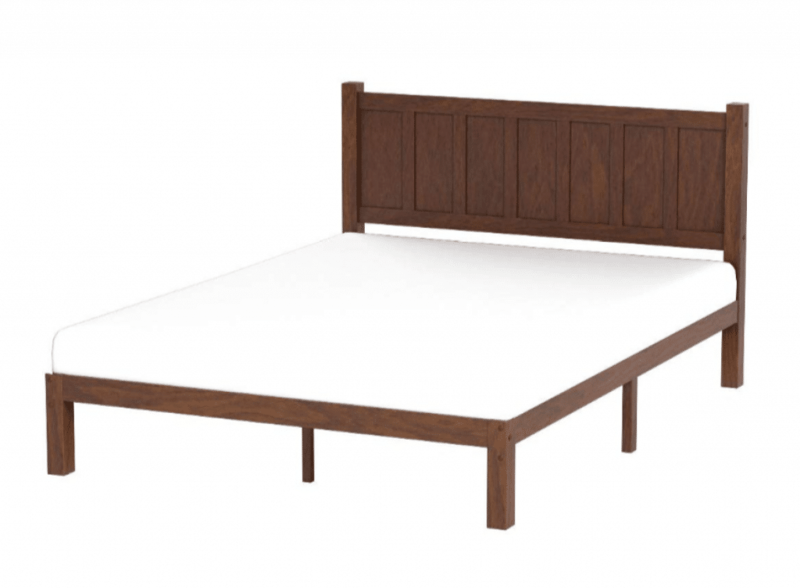 The Zinus Adrian Platform Bed with Headboard is our choice for best all-around Zinus bedframe. The bed frame and legs are made of solid pine while the headboard is made of wood panels. A dark brown finish gives is a clean but rustic look that would look great in any bedroom. The frame itself is made of steel so it’s really sturdy. There’s a layer of foam padded tape on the frame to prevent noise. It also includes plywood slats made to perfectly support your mattress without a box spring. This prevents sagging and increases the life of the mattress while also giving you the support you need at night. The slats also have non-slip tape on them to help prevent your mattress from moving. 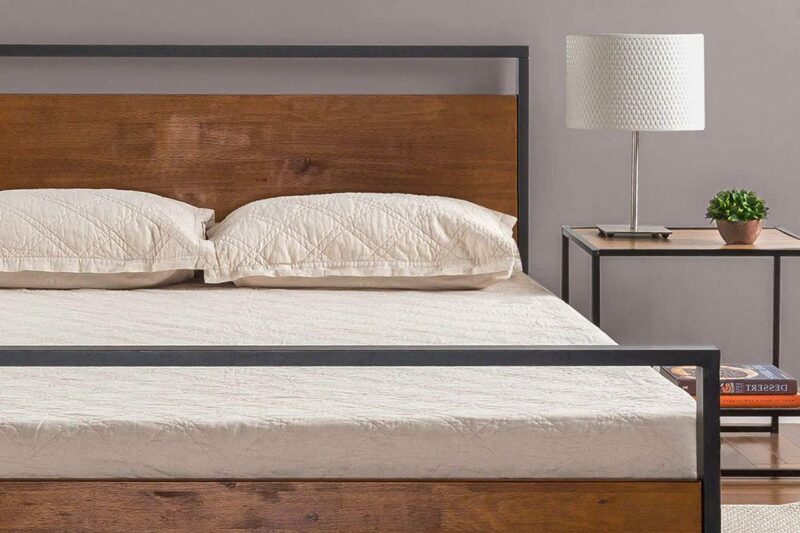 This bed frame is easy to assemble, too. All of the parts are clearly marked and the small hardware needed to put it together come in a well-organized bubble pack so you don’t have to root around until you find what you’re looking for. Some users commented that, while the bed initially seemed very sturdy, it started to squeak and lose a little stability over time though this was not a common experience. That said, Zinus offers a 5-year warranty that should cover any defects. Next up is the Zinus Trisha Low Profile Platforma Bed Frame, a clean modern looking design with a low profile and tufted headboard. The frame itself is made of black painted steel and the tufted headboard is upholstered in medium gray fabric for adds a soft contrast. This bed has a low 7-inch profile and comes with wood slats for the appropriate amount of mattress support or you can use a box spring. 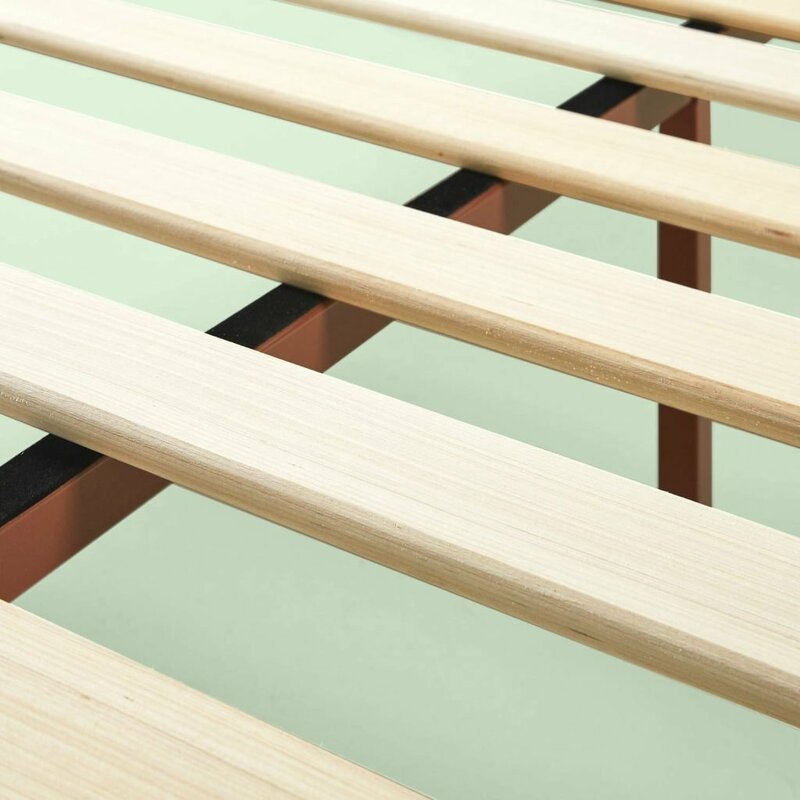 The steel frame has foam padded tape to keep the bed quiet and non-slip tape on the wooden slats keeps your mattress from sliding around too much. This bed frame arrives in a narrow box that makes it easier to move up and down stairs and through narrow hallways. Assembly is straightforward and all the tools are included. 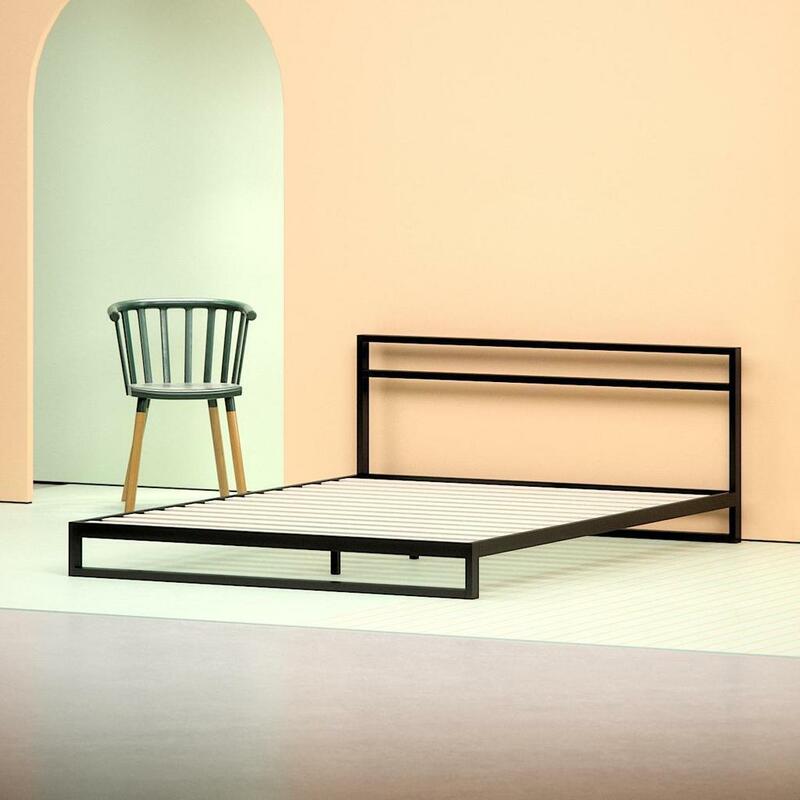 While you only need one person for assembly, this bed frame is pretty heavy so you might need a second pair of hands to help move it into the bedroom. Some users commented that the bed creaked a little after time, though this can be easily solved by occasionally tightening all the screws. Also, be careful putting this on wood flooring, it can scrape your floors if it moves around too much. One more downside is because it’s so low to the ground, cleaning underneath it can be a little difficult unless you have a robot vacuum that can do it for you. 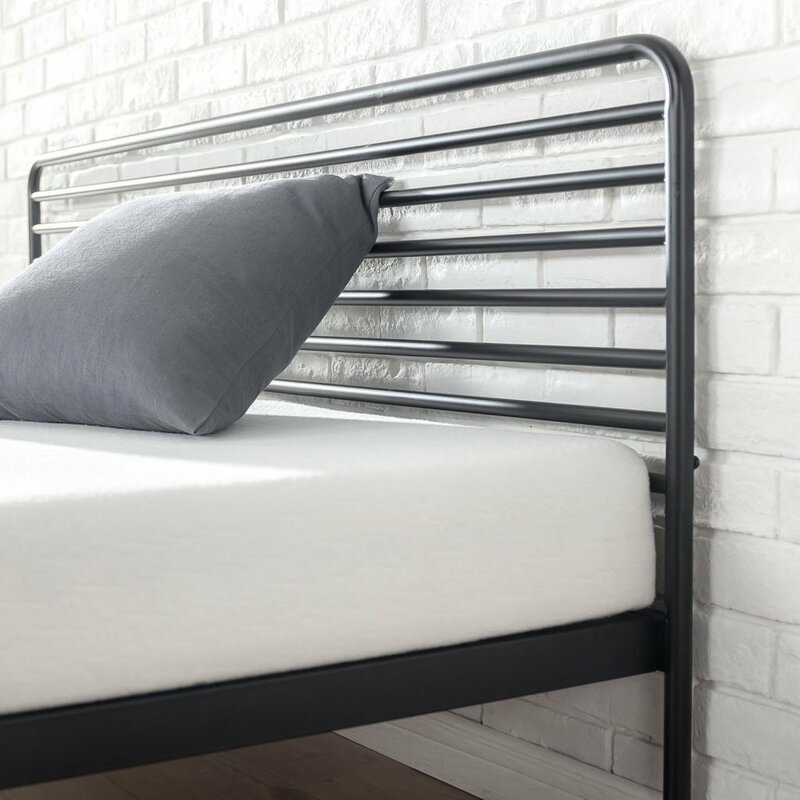 For a bed frame with a bit of an industrial look, check out the Zinus Suzanne Metal and Wood Platform Bed with Headboard. 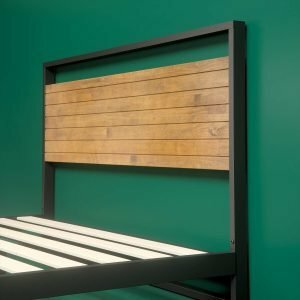 The pine wooden slats on the headboard and footboard have a cherry finish that looks great against the black steel frame. This bed has a low 7-inch profile and comes with wood slats for support though you can use it with a box spring if you want a bit more height. The frame is made of strong steel and has padded foam tape for noise reduction. 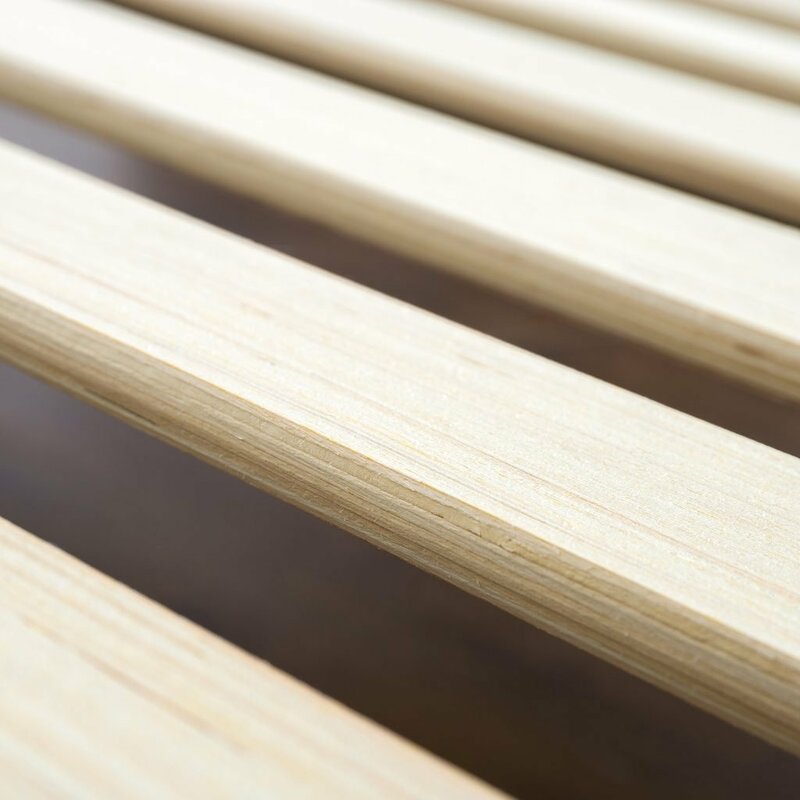 if you choose to use the wooden slats, they have non-slip tape to keep your mattress from shifting. Assembly is simple and can be done in minutes thanks to the well-engineered design and easy to follow instructions. All of the hardware is neatly packaged and labeled and the only tool you need is included. That said, the box is pretty heavy and you may need some help getting it upstairs and into your bedroom. Because of its low profile design, cleaning under the bed can be a bit tricky but it does have enough clearance for a robot vacuum to maneuver under it. Some customers reported that their bed frames arrived with scratches or scuffs on the wood but this was not too common. The bed is covered by a 5-year worry-free warranty so any damage sustained during delivery should be covered. 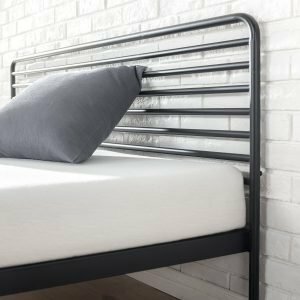 If you’re looking for an all-metal bed frame, take a look at our next pick, the Zinus Tom Metal Platform Bed Frame. A simple design and sleek modern look are stylish without being dated and will fit well into any room. This bed has a 10-inch profile that gives a little more height than come of the other products we reviewed. 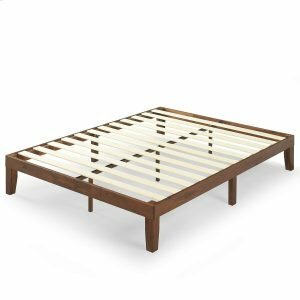 It comes with wooden slats that provide the right amount of support to extend the life of your mattress and prevent sagging so you sleep comfortably at night. 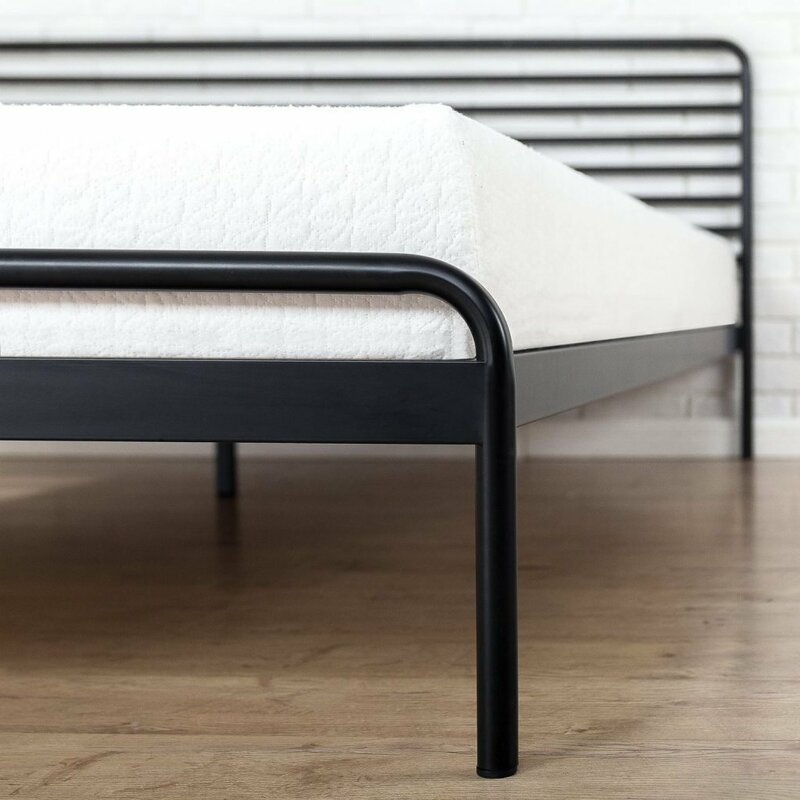 The frame features foam padded tape to reduce noise when you move as well as non-slip tape on the wooden slats to prevent the mattress from shifting. Assembly is easy, too. Everything you need is included and comes shipped in a single flat box that’s easy to move through narrow hallways and small door frames. It is a little on the heavy side, though, so you may need some help moving it to the bedroom. Some customers commented that the bed starts to squeak over time but this can be fixed by retightening the screws periodically. 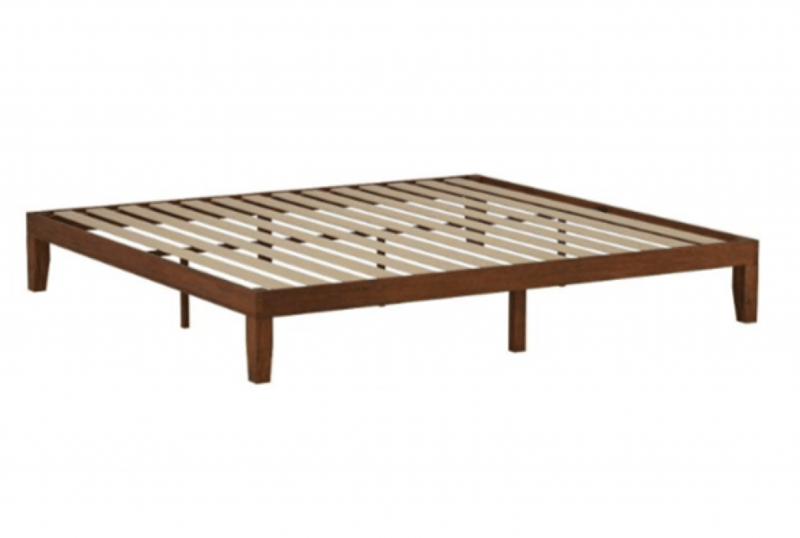 This bed is meant to be used without a box spring and comes with a worry-free 5-year warranty. 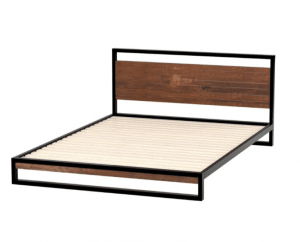 The Zinus Marissa Wood Platform Bed is a great choice if you’re looking for something really simple. This bed features a simple pine frame with an antique espresso finish that’s meant to be used on its own, without a headboard or footboard. Because this bed is designed not to be used with a headboard, it includes the wooden support slats needed to properly support your mattress. The slats also feature non-slip tape to keep your mattress from shifting as you use it. Plus, the strong and durable steel frame features padded foam tape for noise reduction as well. 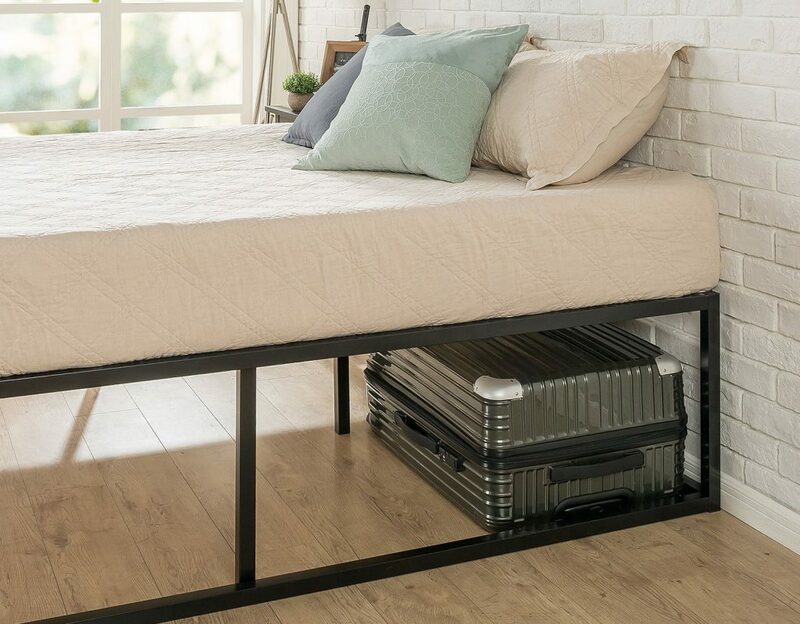 This bed is 12 inches high which gives a lot more height than a low-profile frame and it is also really easy to assemble. Everything you need is included and it can be ready in minutes. It doesn’t weigh as much as some of the other options in our reviews, but you might still need someone to give you hand if you need to lift it upstairs. Although there is no specified weight limit, some customers reported having problems with the center support bar bending over time though this wasn’t a common occurrence. The bed is covered by a 5-year limited warranty which should cover this if it’s due to a defect by the manufacturer. If you’re looking for simplicity and style, you can’t get much better than Zinus. 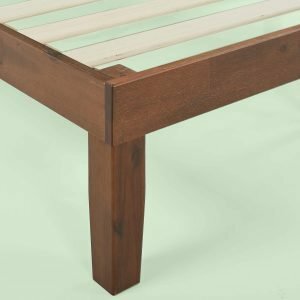 Let’s take a look at what makes the brand so special and what you should look for when choosing your ideal bed frame. There are a lot of reasons to love Zinus. Believe it or not, their stylish and affordable designs are just the beginning. 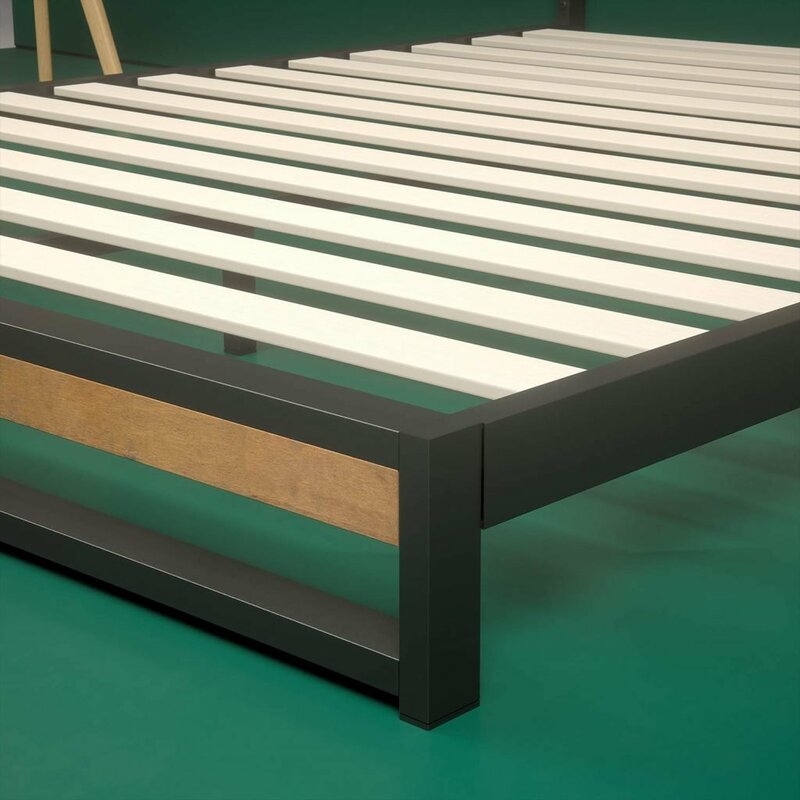 These bed frames are made using high-quality, durable materials like steel and real wood, not particle board or MDF. Customers love the brand and rave about their products. Plus, all of their bed frames are covered by the same 5-year warranty so you can trust that they’re all solidly made and designed to last. There are a lot of things to think about when choosing the right bed frame but Zinus makes it as easy as possible to find something that you love and that’s made for your budget. Here are some of the things you should consider while shopping. Adhering to the weight capacity is important because going over it can lead to structural issues and the bed frame just won’t last. All of these bed frames have a weight capacity of 500 pounds for the Queen and King sizes – this usually includes the weight of the mattress. That’s a pretty generous weight limit so you can sleep soundly knowing that you’re lying on a sturdy, reliable bed. Any time you buy a new bed, you have to consider the decor in the room. What’s great about these designs it there really is something for everyone. 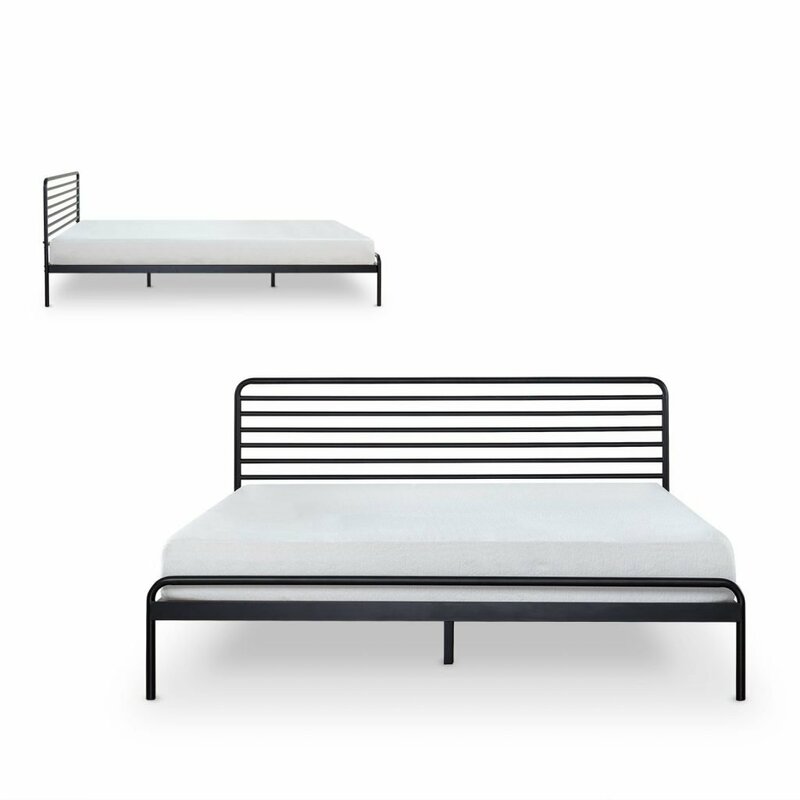 Whether you’re looking for a simple platform bed, a basic all-metal headboard, or something modern and industrial, Zinus has you covered. The best part is that they only use high-quality materials. The metal framework and support beams are made of steel while the wood is genuine pine which is not only more durable than MDF, but also just looks so much better. Another great thing about the design of these beds is how easy they are to assemble. Each frame comes in a flat box with everything you need to put it together inside. The hardware is labeled and packaged so it’s easy to find just the screw you’re looking for and the only tools you need are included. Everyone knows that putting together furniture can be really trying but most customers commented that assembly took between 30 minutes and one hour. Height is an important factor in the look and feel of the bed. 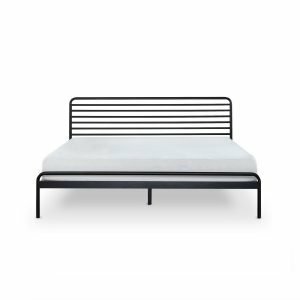 We found a few low-profile options that look really modern and stylish, like the Zinus Suzanne Metal and Wood Platform Bed, as well as more traditional designs with more clearance, like the Zinus Adrian Platform Bed with Headboard. These bed frames come in twin, full, queen, and king sizes. 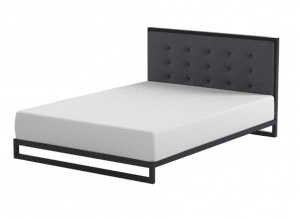 So, no matter what size mattress you have, you can find a Zinus bedframe for it. 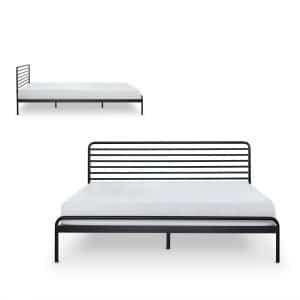 Some of these designs, like the Zinus Tom Metal Platform Bed Frame, are meant to be used without a box spring. Instead, they use slats laid across the frame to support the mattress. 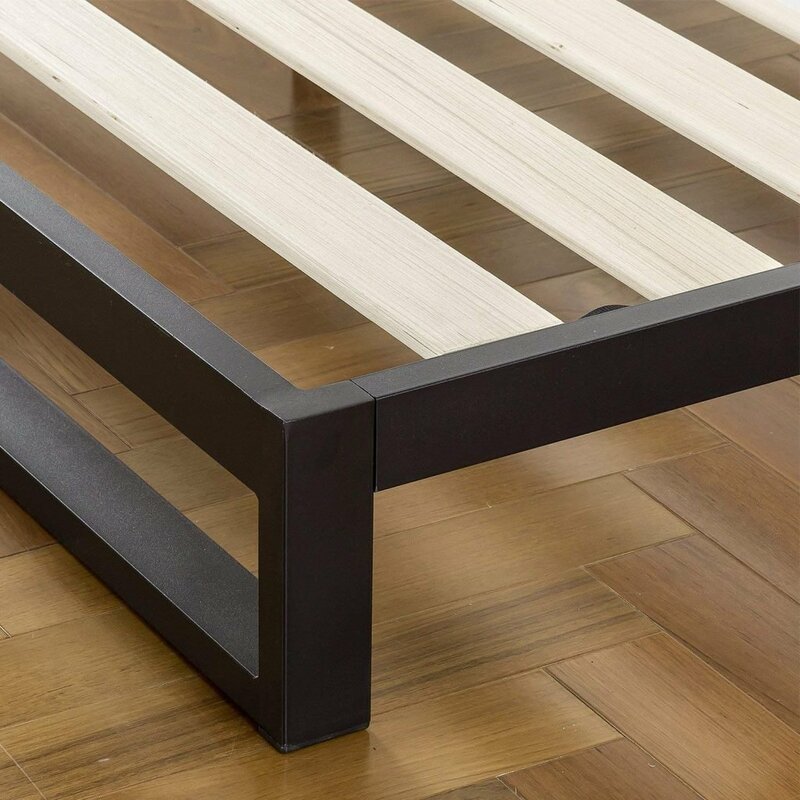 These slats need to be the right distance apart to provide the necessary support for your mattress. If they’re too far apart, the mattress can sag which will shorten its lifespan and make for a restless night’s sleep. 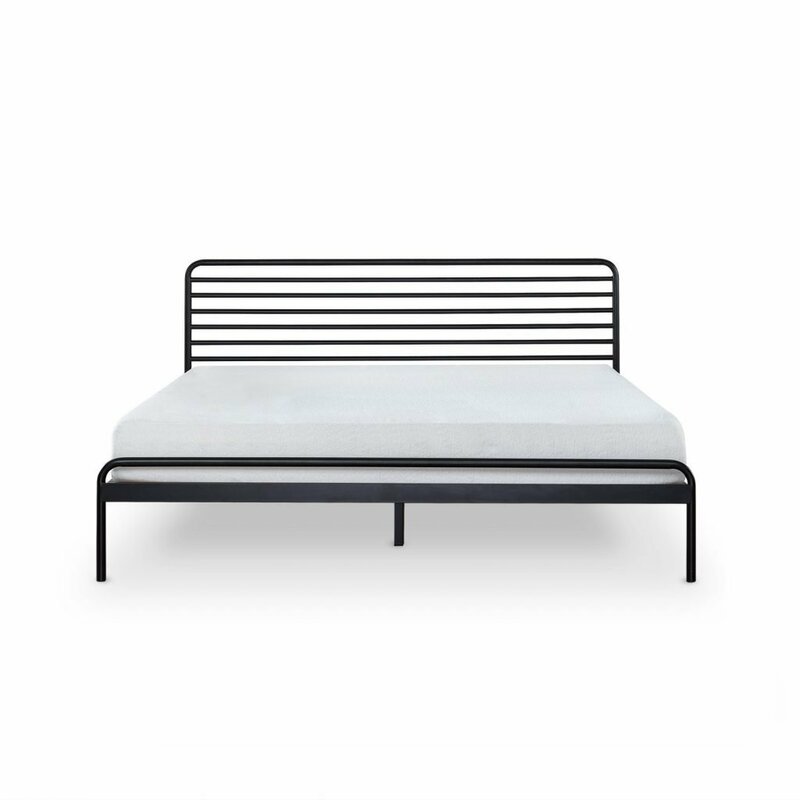 Luckily, Zinus includes the appropriately sized slats needed for the bed frame you order. They’re tethered together so they maintain the right distance so you don’t have to worry about whether or not you measured correctly. There’s nothing worse than a bed that squeaks and creaks every time you or your partner moves. That’s why Zinus uses padded foam tape in the steel part of the frame to act as a buffer for sound reduction. The mattress support slats that Zinus includes with their bed frames come with non-slip tape attached. The hook-and-loop strips help to hold your mattress in place so it doesn’t slide around as you move during your sleep. This not only helps you sleep better but it also helps make sure both you and your mattress are properly supported at all times. 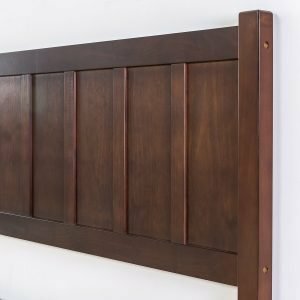 Some of our picks include headboards and/or footboards. 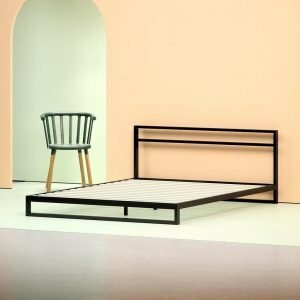 There are tufted options, like the Zinus Trisha Platforma Bed Frame, as well as rustic and industrial designs made of metal, wood, or a combination of the two. First and foremost, this is a stylistic decision. 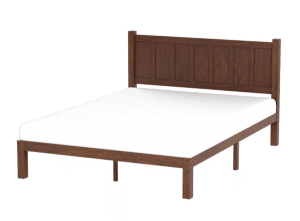 Do you want a headboard and footboard on your bed? 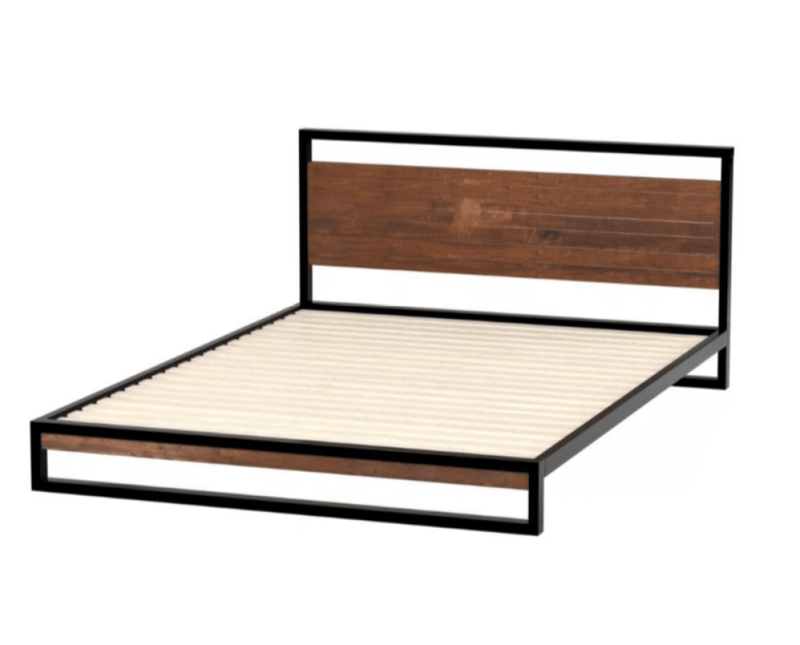 Or do you want something simple like a platform bed? Once you’ve decided, though, that’s usually what you’re stuck with meaning that you can’t always add a headboard to a bed frame later on. It’s also not always easy to remove a headboard or footboard from a bed that was designed to have one. So, once you’ve made a decision, you might be stuck with it. Think about it and be very sure before you make your final decision. All Zinus bed frames are covered by the same 5-year limited warranty for workmanship and materials. That said, you have to make sure you use them properly to make a warranty claim as it only covers problems that occur from normal use. What’s normal use? For Zinus, it’s using the product on a flat, smooth, rigid surface with equal distribution of weight. This is one reason why it’s so important to pay attention to things like weight capacity. The warranty won’t cover issues that arise from putting too much weight on the bed frame. Read the warranty carefully so you know what’s covered and what isn’t. Why is my bed creaking so much? There are a lot of reasons why beds creak but the most common one is that the screws and bolts have come loose. This is pretty common with any furniture that you assemble yourself. The good news is it’s likely an easy fix. Check the fasteners occasionally and retighten as needed. 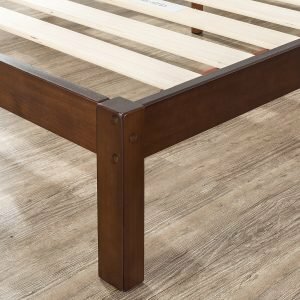 Should I choose a wooden or steel bed frame? It really depends on the look you’re going for. 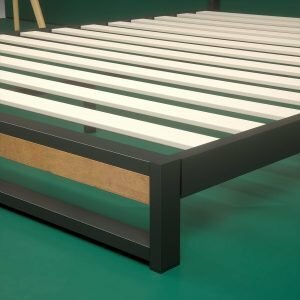 These beds all have steel frames that support the actual mattress but there is a lot of variety when it comes to the aesthetics of the bed. There are a few things to keep in mind, though. Wood is a little easier to damage than metal as far as gouges and scratches go. This isn’t an issue in most cases but one situation where you should consider it a bit more is if you’re buying a bed for a young child. Some kids can be pretty destructive and it’s much more difficult to ruin a metal headboard with toys, crayons, or markers than it is to damage a metal one. You might also consider going with metal if you have a pet that likes to scratch at your furniture. 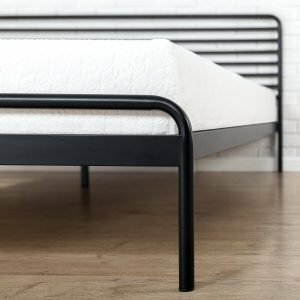 What is a box spring and do I need one? 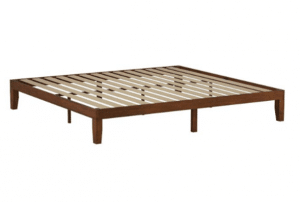 A box spring is a wooden frame with springs inside covered in plain fabric. It acts as a support base for a mattress and was at one time pretty common. Most mattresses you buy at a mattress store typically sell mattresses and box springs in sets. 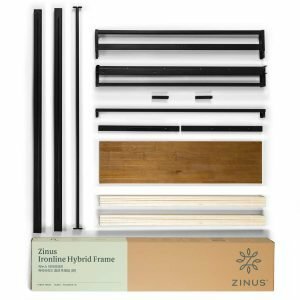 You don’t actually need a box spring with a Zinus frame. As we’ve mentioned, they all include slats that provide the support your mattress needs. That said, some people still prefer a box spring. It adds a lot of height to your mattress and there are people who find them more comfortable. If you do decide to use a box spring, make sure you can use it with the bed frame you choose. Not all of the items we chose for our reviews can be used with a box spring. 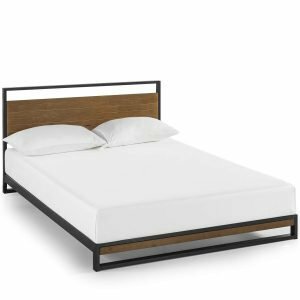 The Zinus Adrian Platform Bed is our Editor’s Pick and the best all-around product in our reviews. 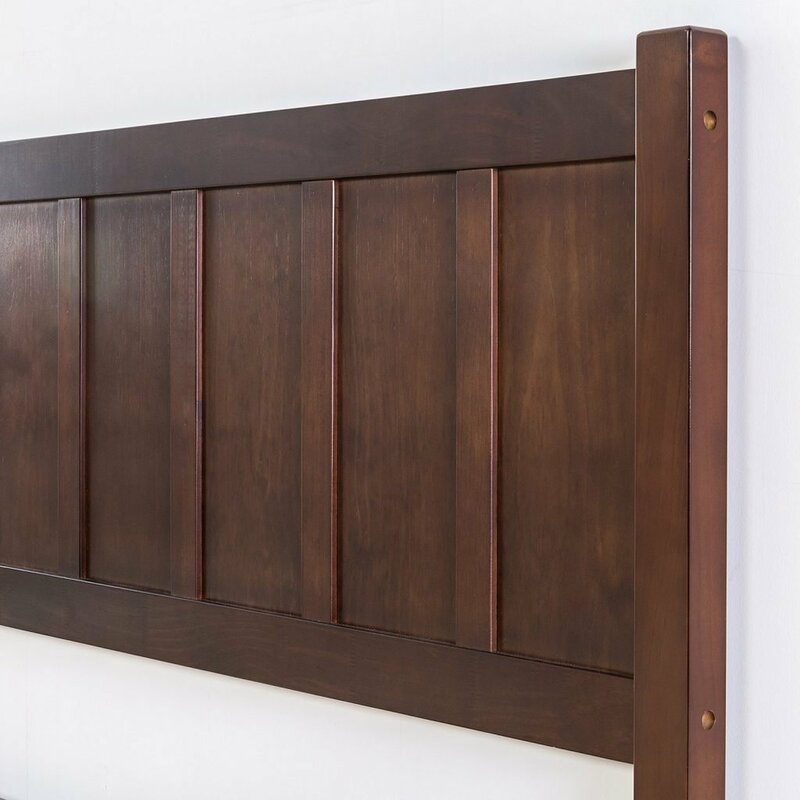 If you’re looking for a wooden bed with a bit of a rustic feel, the dark brown finish and wood-paneled headboard might be just what you’re looking for. 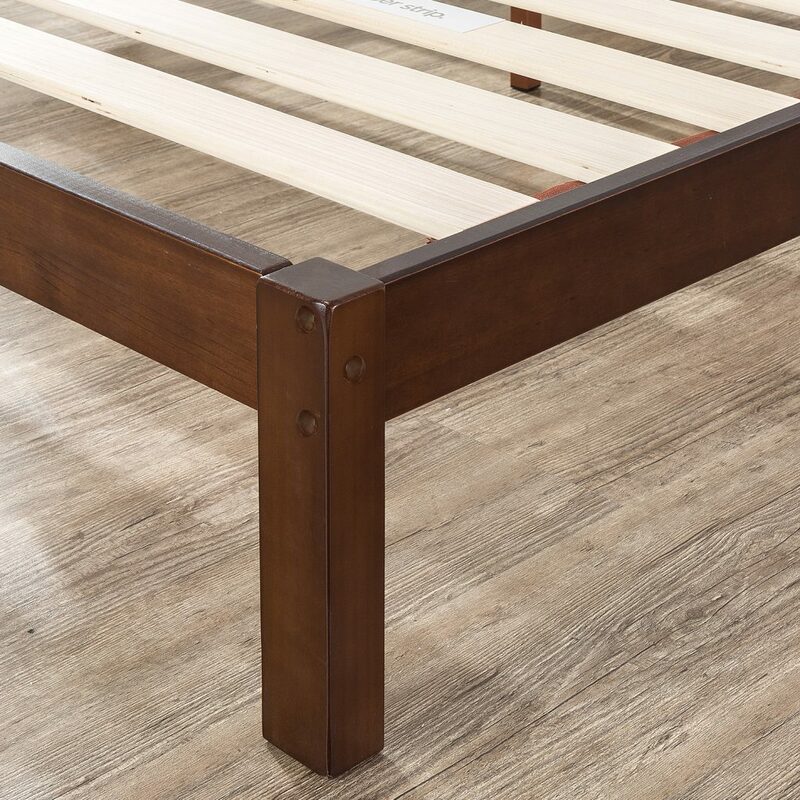 For a clean, modern design, check out the Zinus Trisha Low Profile Platforma Bed Frame. This is a perfect choice if you prefer an upholstered headboard. The tufted gray fabric looks great against the black steel frame and makes it a centerpiece in any bedroom. If you’re into the industrial look, there’s the Zinus Suzanne Metal and Wood Platform Bed. The steel frame and cherry wood slats play well off each other and really add a lot of detail. It has a low-profile design and can be used with a box spring if you want to add more height.